Shippon Roost is a detached stone and slate Snowdonian longhouse. The beautifully beamed sitting room is converted from a former hatchery, with high vaulted ceiling. The bedrooms are formed from the old grain store. The kitchen was cattle byre. The rear stable door is cuddled by a private enclosed patio with floodlighting, barbecue and furniture. From the balcony, guests can watch owls and buzzards, which nest nearby. 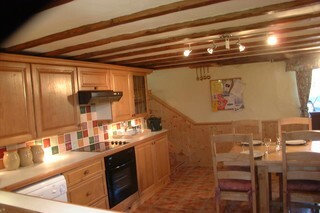 Guests to Shippon Roost with limited mobility will find this charming cottage very easy to access, with parking immediately outside both of the front doors. Hallway with 3 bedrooms and bathroom off. 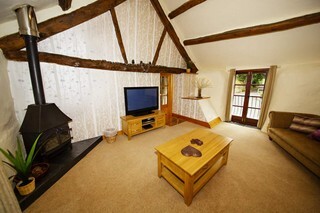 From the hall, 4 steps up to airy sitting room with Villager stove on stone and slate hearth. Small balcony with French doors overlooking the courtyard and valley. Rear views to Arenig mountain. 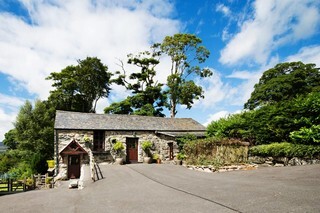 From the hall, 5 steps down to newly refurbished country dining kitchen, with front and rear stable doors to gardens. 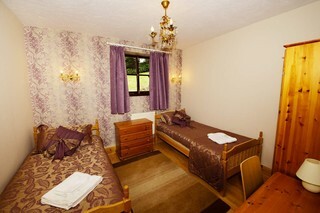 Bedrooms are 1 double with half-tester canopied bed, 1 twin and 1 full-sized bunk-bedded room. Gas-fired central heating. Fuel included. No smoking in the bedrooms please. 1 small dog welcome – special rules apply. Minimum stay 3 nights. The property features gas central heating with a a microwave, a fridge/freezer, a washing machine, a dishwasher, 2 TV’s, each with a DVD player, a video and a radio/cassette/CD player. Steam iron & ironing board. Full bed linen is inclusive, though not cot linen. Tea towels and towels are provided. Steam iron and ironing board. 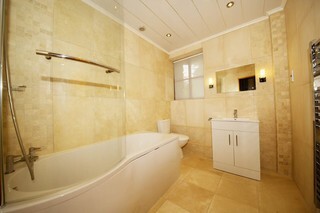 The bathroom has a bath, shower, hand basin, WC and a shaver point. A travel cot, high chair, safety gate, socket covers and fireguard are provided. For your convenience, a power-washer and storage for cycles are available. Cycle hire available in Bala. A barbecue and garden furniture are provided and there is a Barn for barbecues if the weather is not co-operative. An elegant function room - The Retreat - is available for hire for group usage by prior booking.